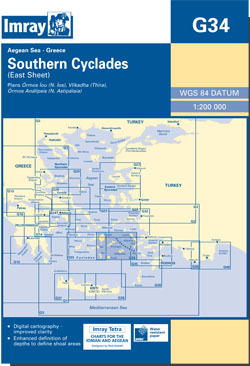 The southern Cyclades islands, eastern area. Scale: 1 : 190.000. Larger scale plans of Ormos Maltezana (Astip«laia) and Ormos Kalimnou (Kalimnos). For this 2014 edition the chart has been fully updated throughout. A new plan of Koufonisia replaces the sketch plan of Vlikadha (Thíra). The positional accuracy of the Órmos Maltezana plan has been improved.